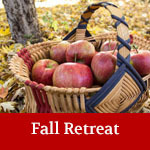 Enjoy the autumn foliage in a charming New England town famous for its covered bridges. Come for a day of workshops for weavers at all levels. Leave with a completed basket. Enjoy weaving with good friends and making new ones. Beginners are welcome! Basketmaking tools: scissors, flat head screw driver, pencil, tape measure, old hand towel, a dozen clothespins, a utility knife or hunting knife, a weight. 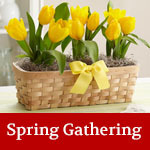 Learn to coil with pine needles as you create this pretty basket. Beginning with a slice of a walnut shell, you will start with the wrapping stitch. You will learn to make the naturally spiraling chain stitch, and the wheat stitch will finish off your basket. Learn about different kinds of pine needles and how to prepare them. Some attendees will not finish the project in the class time, but you will have the information to easily finish on your own. Dimensions: 1”x3 ½”. Basket tools not needed, just bring a pair of small, sharp scissors. Shakers are known for a variety of basket styles. 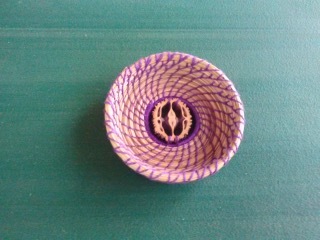 I made changes to their and Lyn Siler’s version of the Shaker Bottom Basket in the size and shape but base technique is very Shaker. It is done in natural reed with a handle, the simplicity and look of it is very pretty and unique. Dimensions: 8”x12”x7”. 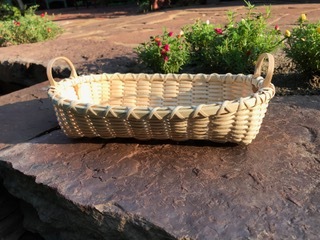 Have fun weaving this large rectangular basket woven with natural and dyed reed on a wooden “D” handle. 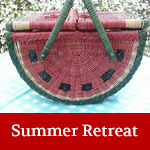 Woven with various sizes reed , seagrass and a specially prepared 2” wide fabric weaver with a holiday theme. Various fabric weavers to choose from with Christmas and Winter prints on them. Dimensions: 12”x8”x9”. 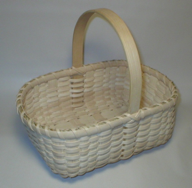 This lovely rectangular to oval basket is a reproduction of an old Shaker basket design. 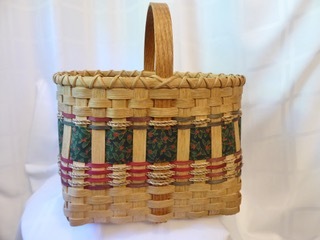 It is woven with flat reed staves, tiny flat oval weavers, half round rims and delicate close notched oak side handles. Students will weave row-by-row learning to scarf their overlaps. Learning to bring the sides of the basket gently to vertical will be emphasized to create the graceful lines of the basket. The basket rims will be fully scarfed to look like hand carved rims and then double lashed. Dimensions: 10”x4”x3”.